XiVO CC includes a call recording feature: recording is done on XiVO PBX and recorded files are sent to the XiVO CC Recording server. It’s possible then to search for recordings and download recorded files from Recording server. If connected user is an administrator, he will be able to download also an access log file that track all action made on files by all users having access to recording server. For configuring this feature, see Recording configuration. These files will be automatically resynchronized from XiVO PBX to XiVO CC Recording server each night. Find by caller, callee, agent number etc. 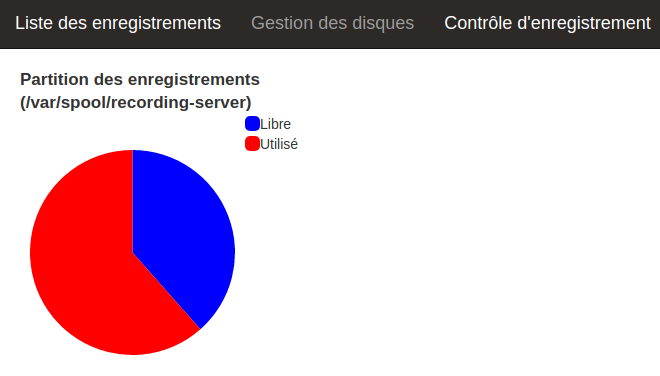 On Recording server, one can monitor the space used by the audio files stored in Contrôle d'enregistrement menu. Any action made from the UI on a recording file (result, listen or download) is tracked in access log that can be downloaded by clicking on following icon if you have administrator role. This access log is defined to track information for 6 months by default. In case an agent has transferred a call to another queue, which was answered by the agent available in that queue, the recording feature will display both agents (name and number) in column Agent and both queues (name and number) under column File in one recording. Recording is stopped when both parties of the call are external. For example if an external incoming call is recorded and if, at some point, it is transferred to an external party, as soon as the transfer is completed, the recording of the incoming call will be stopped. In the same way if an internal user makes an outgoing call which is recorded and then transfers it to another external party, as soon as the transfer is completed, the recording of the outgoing call will be stopped. This behavior can be deactivated, see configuration section. For configuring this feature, see Recording filtering configuration. Recording server allows to prevent some numbers not to be recorded. 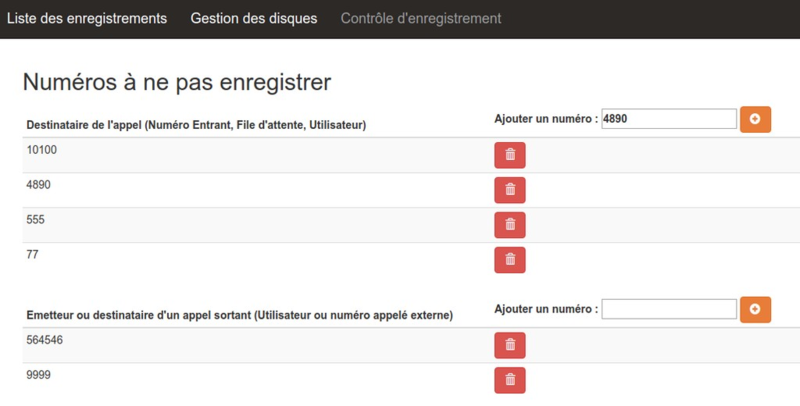 To do so, navigate to : http://XIVOCC_IP:9400/recording_control and in page Contrôle d'enregistrement you can add or remove the number to disable recording on this number. Recording can only be disabled for specific Incalls, Queues, Users and External called numbers. Recording can’t be disabled for one Agent. Recording can only be disabled by the object number (to disable recording for one queue it must have a number).